Under Director William Beveridge Houghton Street saw constant building, but LSE expansion also included the acquisition of a permanent sports field in South London. Beveridge, who had been a frail child, was later a keen walker and badminton and tennis player and took an interest in athletics. For him the provision of student sports facilities was the mark of a good university. The 1920-21 LSE Calendar records a lease on playing fields in North West London at Alperton. However the grounds were small, only nine acres, and it was a long journey from Temple Tube station when the Piccadilly Line stopped at Hammersmith. The ground cost £6,130 and the construction of a temporary pavilion and improved drainage cost a further £3,200. Initially the ground was shared with the Guaranty Trust Company and other temporary leases but the proved so popular the School soon needed sole occupation. The purchase was funded with a loan from the Governors to the Students’ Union to be repaid from the 4.5% of student fees that was allocated to the Athletics Union. The Field Finance Board, chaired by the lawyer HC Gutteridge, was established to manage the finances and the arrangements for the site. 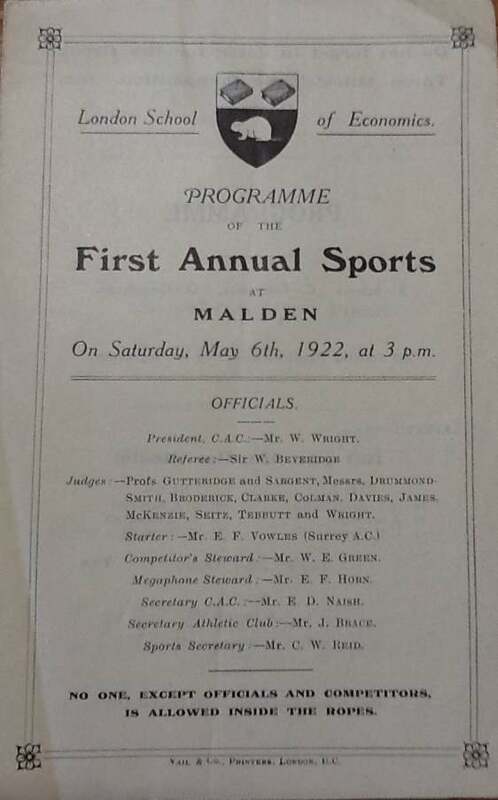 The School’s first annual sports day was held on Saturday 6 May 1922 with Beveridge as the referee. The events included the 100 yards, 120 yards hurdles, 880 yards flat, high jump and putting the weight. There was sufficient interest to hold heats in some events but there was only one women’s race – the 80 yards. The afternoon ended with an obstacle race. The Victor Ludorum cup was donated by Hugh Lewis, one of the School’s governors. The medals for the winners had been donated by Mr Dharmaratne – probably Tantirige Cornelis Dharmaratne, a Sri Lankan evening student and barrister. Throughout the next decade the Director’s Report comments on LSE’s sporting prowess. In 1924 the first XI football team was the first LSE team to reach an inter-collegiate final losing 2-1 to UCL. In 1925 a golf team started and at some point Malden acquired a 6 hole golf course. By 1929 the School had won the intercollegiate football cup, retaining it in 1930 and 1931. Away from Malden there was other sporting success. The Boat Club provided the School’s first inter-collegiate victory winning the University Winter Eights in 1925 and in 1928 they won the Allom Cup, LSE’s first major intercollegiate success. In the same year badminton, Beveridge’s sport of choice, brought success in the Larcome Cup for men’s intercollegiate badminton. The women’s badminton team won all their matches but there was no cup for them to win! This was rectified in 1929 when LSE staff donated a new university trophy for women’s badminton. In 1929, 1930 and 1931 the men and women’s badminton teams all won the intercollegiate cup. The women’s sculling team won an intercollegiate cup in 1930. By 1926 the ground was regularly used by four rugby teams, two football teams and the men and women’s hockey teams as well as the tennis club. 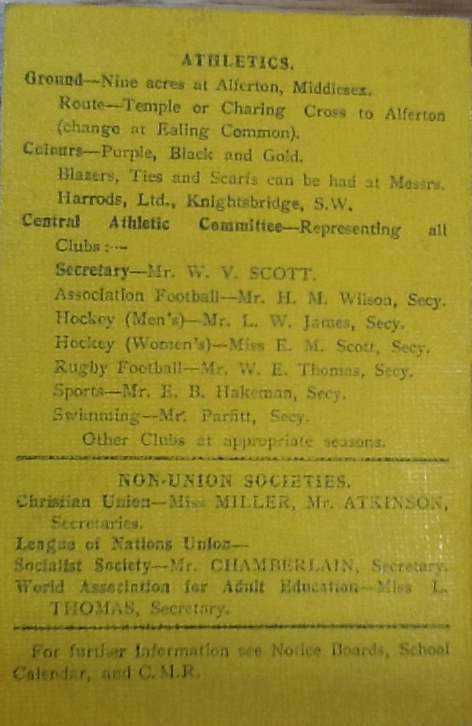 In 1926-1927 the women’s cricket team started (though sadly no photographs survive) and by 1927-1928 there were sporting clubs for athletics, badminton, rowing, men and women’s cricket, fencing, golf, men and women’s hockey, women’s lacrosse, netball, rugby, football, sculling, men’s and women’s swimming, tennis and a rifle club. The social side of life was not ignored and in June 1926 it was agreed that a bar could be opened for the sale of beer only. All this activity led the School to re-think the management of the sports ground. In 1925 the governors decided to use their reserve fund to complete the purchase of the sports ground and use the sinking fund for improvements. The School agreed to the need for a permanent pavilion in 1928 at an estimated cost of £6,000. The aim was to raise the funds from staff, students and governors and an entertainment tax was placed on dinners, dances and social functions at the School. These initiatives raised £2,750 and by summer 1929 the central block of the permanent pavilion was completed, but with a debt of £3,000 it was decided not to continue until the debt had been cleared. The women’s teams still had to use the old pavilion. The new pavilion was finally completed in 1932. By then the School had taken over direct management of the ground and replaced the Field Finance Board with and Athletics Advisory Board, despite complaints from the Students’ Union. The Malden Sports ground has survived the years – it was given over to vegetable growing in the Second World War and afterwards was threatened by the post-war demand for new housing. Despite this it remains a part of LSE sporting life. Dear Sue, I enjoyed your latest piece on the playing fields of LSE and it reminded me of a book by David Kingsley, How World War II was Won on the Playing Fields of LSE: The Story of Willis Wright — groundsman and unsung hero, (London: Inky Legs Press, 2003). This gave an account of the contribution the playing fields made to the war effort by producing lots of letters from the archives. Very funny. What a pity that photos of the first women’s cricket team at LSE are nowhere to be found! Given how popular cricket is today those early women cricketers would be icons.